Weird title for a LinkedIn post, huh? Let me first disclose that I am an Under Armour believer, investor, and so forth. So I am very biased, I admit freely. I love Under Armour everything, especially some shoes! So, I spend the extra money to buy them; there are cheaper shoes all over, but these look the best (to me), hold up well, and are overall worth it. I recently bought a black pair of UA tennis shoes, so I can wear them with anything. Recently, however, I laid down Bermuda sod in my back yard. For those who have never done that, it is messy, dirty work. I did not want to get my new, Under Armour tennis shoes dirty, but I needed a pair of tennis shoes, work shoes if you will. So, I bought some $40 Adidas shoes, the cheapest I could find. My wife criticized me for buying 2 pair of black tennis shoes so close together. 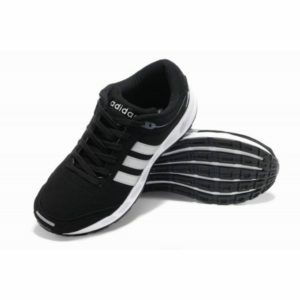 But my rationale was this: I’ll have a cheap, simple pair of Adidas shoes (pictured above), that I’ll use as work shoes, and get dirty, and a nicer pair of Under Armour shoes for going out. The Adidas shoes cost less up-front, and they won’t look as good, or last as long. But they’ll serve my purpose. You don’t always have to buy the most expensive brand of everything, there are plenty of things you can save money on by buying less-expensive brands (I’m looking at you, Kroger-brand, Great Value, & Equate). I buy those brands all the time myself, I’m not made of money! But this idea had me wondering, maybe I can apply this to my everyday business life. Maybe people want to “buy off-brand” everything, even their HVAC equipment, service, & maintenance; maybe everyone always wants cheaper. Now, let me explain the differences. First off, Gibbs Service Company is not a dealer for any brand of equipment. Why is that important to you as a customer? It means that we have not guaranteed to buy a certain brand, so we don’t shove any brand down your throat to meet our quota (car dealership, anyone?) It also means that we don’t favor any brand financially over another, we have no incentives. Our only incentive is making you, the customer, happy! So, we recommend what we have had the best success with over 45+ years of experience. Yes, that comes with a price tag. But, I ran some calculations for you, and the $10 you spend on Brand A will take an estimated 8 years to pay for itself, while going with Brand U would only take 6.5 years, even though it requires $20 in an up-front investment. Again, we’ll be happy to go either route. I simply wanted to give you options, and give you as many facts as I could. Here’s what happened: No one wanted Brand A(didas). Even though it was cheaper up-front, they had a solid rationale, from a trusted partner as to why, and how the extra money would help going forward. The buildings we service house hundreds to thousands of people. No one wants to have their A/C go out in 100 degree weather, and have all those people mad at them! The trust factor & comfortability factor are unquantifiable. There are always going to be people who use the cheapest products & service. Maybe you strive to be Wal-Mart, and always have low prices. That’s the customer you want. For the rest of us, we don’t like to play the price war game. At Gibbs Service Company, we hire & train better technicians. We have a better system. We’ve proven that by having so many customers for 20, 30, 40 years. My Grandad’s very 1st customer in 1972 is still a customer today! We’re not getting rich off of our customers, but we also don’t purposely underbid a job to win it. We put a lot of thought into our prices; We are a business, not a charity, but we do our jobs at best value to our customers. We have proven over time that we have a better mouse trap. Better mouse traps aren’t the cheapest mouse traps. Do you really want to spend over 2,000 hours a year wondering when your heating/air conditioning is going to break? Wondering how long it will take your service company to get on the call? Then, wondering if they will actually know how to fix the problem? An investment in Gibbs Service Company is an investment in your building, in your employees, and in your peace of mind. We mess up; we’re not perfect. But we make fewer mistakes, and when we do, we correct them. We’re a family that you can trust. Gibbs Service Company- “Big Enough to Meet Your Needs, Small Enough to Understand Them” . So, buying cheaper tennis shoes, loaves of bread, & off-brand trash bags can make sense. I made it through college on Tootie Fruities, Honey-Nut Scooters, Marshmallow Mateys, & Apple Orbits cereals, and I turned out fine! But some things are worth the price of admission; do you want to leave your workplace, school, or Church to chance with Shur-Fine Service Company? If less down-time, partnering with a more knowledgeable, trustworthy HVAC service company, and staying cooler interests you in any way, call us at (501)-945-9382, and ask for Tyler.